This year's Coastal Bend Day of Giving supports 50 area nonprofits on the forefront of assisting those in need, and Corpus Christi Metro Ministries is one of them. It's the mission of Corpus Christi Metro Ministries to help create a community that is free from hunger and homelessness by feeding (the mind, body, and spirit), sheltering and transforming lives. In the 1970s and early 80s, Corpus Christi found itself with a burgeoning homeless population. Unfortunately there were no formal facilities to help these hungry children and adults. In response to this need, the Corpus Christi Cathedral, First United Methodist Church and First Presbyterian Church began providing hot meals at their respective locations. The demand, however, soon became too great. Mayor Luther Jones called a meeting of the leaders of Corpus Christi's major downtown churches. A four-fold plan was established to provide food, shelter, employment assistance and spiritual care for the poor. The John G. and Marie Stella Kenedy Foundation purchased a facility to house the entire operation and turned it over to Metro Ministries, which incorporated in October of 1982. In January of 1983, Metro Ministries was recognized as an exempt 501(c)(3) organization by the Internal Revenue Service. Metro Ministries' Board of Directors, staff and volunteers are committed to continuing to care for the chronically homeless on Leopard Street and the hundreds of working poor who go to them each week. As part of their continuing efforts to improve their services, they constructed a $2.4 million facility (10,000 square feet) that serves as the new home for the Loaves & Fishes free cafeteria and Rainbow House for women and children. Gabbard Health Clinic – This primary care clinic provides free healthcare to Metro Ministries residents, the uninsured, and underinsured in the Coastal Bend. They provided 917 patient visits at no cost to patients. Rainbow House/Foster Sanctuary – This transitional housing program serves homeless women, homeless women with children, and aged-out foster women. Through partnered resources, Metro Ministries helps them reach independent living and self-sufficiency. They saw 179 women and children graduate to stable housing. Rustic House – This transitional housing program for homeless men with a disability and/or who are more than 60 years old is focused on helping residents reach independent living and self-sufficiency. 61 men transitioned from Rustic House into stable housing. Vineyard Social Services – Vineyard's case managers and graduate-level interns are the point of entry that provided clients with thousands of connections to community resources. Services include: individual/family counseling for program residents and community clients; pastoral care, bus passes, hygiene packets, case management, financial assistance for rent and utilities to keep families in their homes, and referrals to resources for skills training and job readiness. They provided 7,733 total client services, including services to 1,454 new clients. 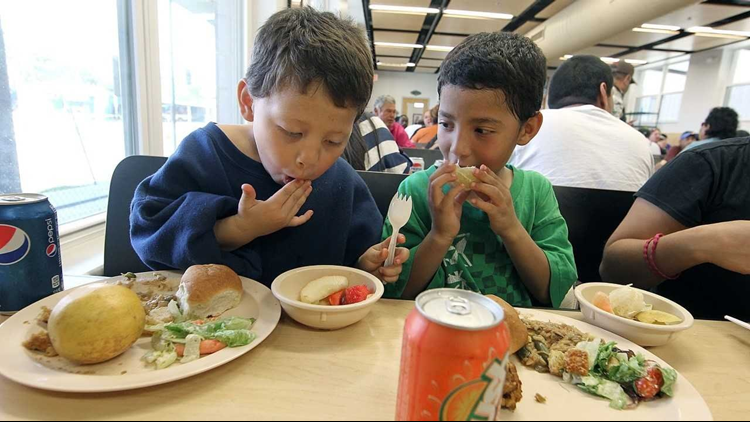 Loaves & Fishes Cafeteria – This free, full-service cafeteria serves as many as 400 meals per day to the homeless, poor, working poor, elderly and disabled. Family Dining Hour, a private one-hour dining experience for resident and community families, offers quality time in a separate dining room. They served 104,551 meals to more than 4,541 unique clients. Check out the links below for more information about Corpus Christi Metro Ministries.